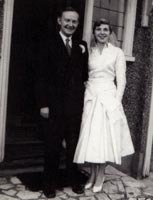 Tiny pic of my parents on their wedding day, December 5, 1959. Standing at the front door of Dad’s childhood home in Coulsdon, Surrey. It was, of course, a beautiful cloudless day as I headed toward the Richmond-San Rafael Bridge yesterday. It is not lost on me that one has to pay for the privilege of leaving Oakland, either via that bridge or the Bay Bridge, yet one has to pay for the honor of entering San Francisco*. Leaving it is free, and it’s your loss. But I knew I had to keep my appointment and be a grown-up, with all the horrors and lack of fun that entails. I got to the storage half an hour before the appraiser was due, so I started going through some things before he got there. There was my American grandfather’s World War I uniform in his trunk; my mother’s wedding dress, which I had preserved a few years ago – you can see a tiny picture above – it is a gorgeous, heavy, ivory satin dress; a silhouette of my mother as a very young child; the beautiful watercolor of a Scottish stream my father bought for a shilling when he was 12 years old. I had to walk away and take a moment to pull myself together before the appraiser appeared and I had to pretend to be a rational adult. I went to the window and looked out at the sunny day, wondering how my grandparents’ and parents’ lives had been distilled down to these few pieces in a place none of them had ever seen or known, to be looked over and assessed by strangers, who would never know their true worth lay in who had touched them, worn them, used them, loved them. Rest assured that the items I mentioned, along with some others, will never be sold. But as I headed home, slower in the late afternoon traffic, my eyes filled with tears as I passed Frank Lloyd Wright’s Civic Center in Marin, the familiar and always beloved skyline of my beautiful San Francisco. Because the ghosts of the past were closer than usual. *Once when returning to the City, I discovered that I didn’t have enough cash for the then $2 toll. The toll person told me to go to the office and radioed my license plate to the office. I was driving my 1966 Mustang convertible in those days, so was a little more noticeable than I am now in my humble Taurus. I wrote a check in the office, blushing with embarrassment. They cashed it immediately. **My sister used to teach across the Bay from San Quentin. Her students thought it was a castle, and it does look like one a bit, especially in the fog. She never corrected this impression, though I can’t help but wonder why some of the best real estate in the Bay Area (Alcatraz and San Quentin) is devoted to prisons. The true worth of a person or memories can never fairly be appraised by anyone. No matter what, always remember the good times, they will last you a lifetime. Ah, man…you brought tears to my eyes. Stop that nonsense!